Last Sunday, a friend and I went to Church. But not any Church. 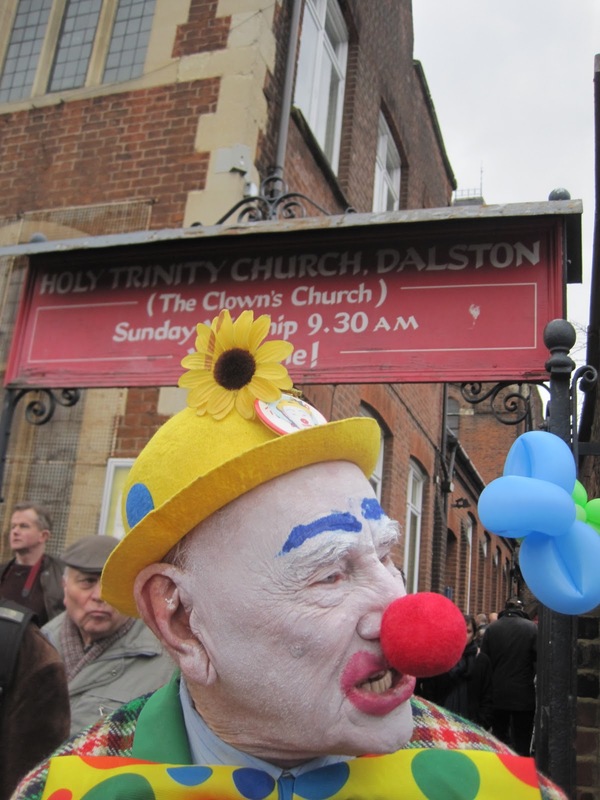 It was the Holy Trinity in Dalston, aka The Clown Church. 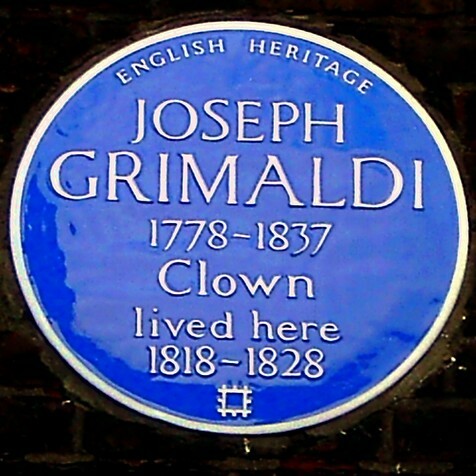 On the first Sunday of February each year, a very unique service takes place in memory of the famous King of Clowns, Joseph 'Joey' Grimaldi (1778-1837). Along with the normal congregation and clergy, a host of clowns from across the land, and in all manner of age, size, slap and regalia, make the annual journey to honour their hero. It was certainly a surreal and colourful affair, and as it is so popular, we were fortunate enough to arrive in time to secure ourselves a pew. The opening hymn was 'Lord of the Dance', during which the Clowns and Clergy arrived down the aisle. A musical performance by Eek & Mr Mudge followed by a few clever magic tricks caused much delight to the numerous children in the congregation. 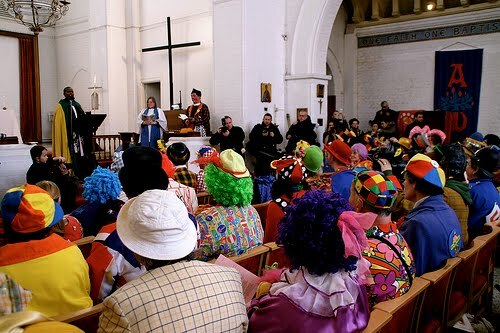 Yet amidst the slapstick, japery, juggling, bubble-blowing and horn-honking, the service is in fact a proper religious affair, which despite the contradiction, the clowns take very seriously indeed. There were a few readings (one was read by The Rt Hon John Bercow, speaker of the House of Commons) and a lot of hymns, which the clowns sang along to in a hearty voice whilst tapping their over-sized comedy shoe-clad toes. A slightly more sombre and quite moving part of the service, was when 'Send in the Clowns' started playing softly in the background as candles were lit to accompany the laying of a wreath (resembling a clown face as far as I could tell from the quick glimpse I caught of it) in memory of clowns who have passed away. 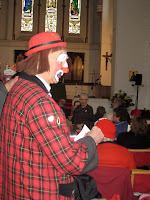 The Chaplain quietly read out the names including Bilbo, Frosty, Buddi, Sir Norman Wisdom and The Unknown Clown. The Clowns then read together The Clown's Prayer, thanking God for the precious gift of laughter. 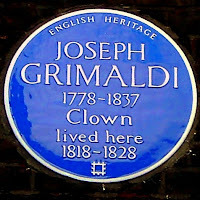 Grimaldi was born in Clerkenwell and spent most of his life living in Islington, including 10 years in Exmouth Market which is commemorated by a blue plaque. He followed his father's pantomime-esque footsteps and performed his stage debut at the Sadlers Wells theatre aged three. 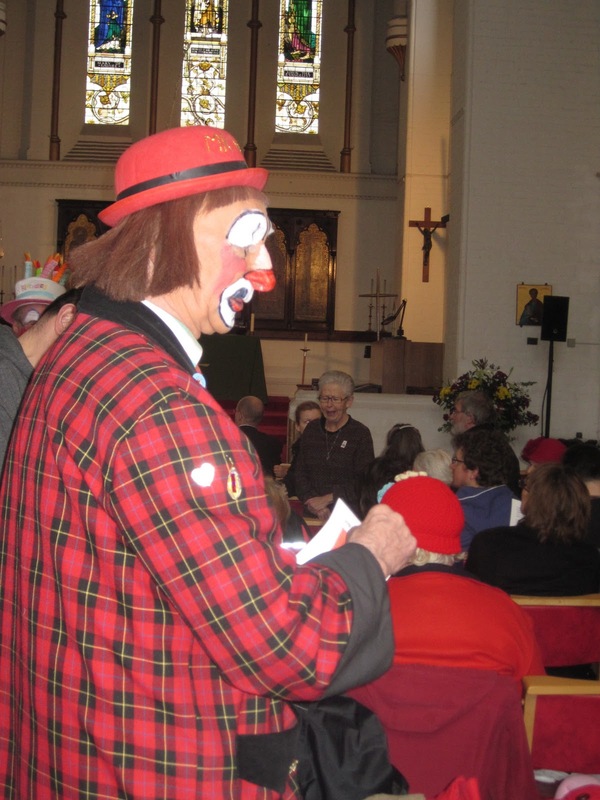 It was in 1946 that Clowns International was founded and the clowns started their memorial service for Grimaldi each year at St James' Church, Islington (where Grimaldi is buried in the graveyard, now called Grimaldi Park on Pentonville Road, N1). The Church was demolished having suffered bomb damage in the war, hence they relocated their annual service to Holy Trinity, Dalston as of 1959, where it has been held ever since. The Clowns Gallery (which has moved from Holy Trinity to the Mill House at Wookey Hole in Somerset) houses various wonderful clown exhibits. The most popular being the famous collection of painted clown eggs. 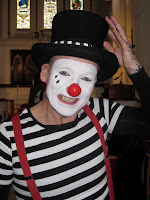 When a new clown joins, they have their slap (hair/make-up) registered by having the look replicated onto an egg so as to make sure their look is unique to them. Traditionally, they were painted onto chicken eggs, but now pottery eggs are used. Apparently, when a clown dies, his egg is smashed. It was definitely a Church service like no other and I'm really glad I had a chance to experience it. If you'd like to attend, put the first Sunday of February in your diary. Don't forget your red nose and squirty plastic flower. Or perhaps you'd like to become a proper clown! In which case you'll find everything you need to know at Clowns International. Honk, honk! Ha! I'm afraid my look was very civilian. Only true clowns are allowed to wear full regalia & slap! I LOVE the old clown with the big glasses and brows!